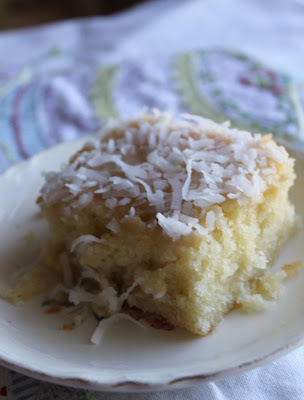 This month for the Secret Recipe club I got Janie of Fantastical Sharing of Recipes. She is the organizer between the scenes for Group D.
I almost picked her Starbucks Pumpkin Spice Latte Copycat Recipe. After all it is the season for pumpkin and I do love me a good Pumpkin Spice Latter but then I eyed her copycat recipe for Cinnabun Cinnamon Rolls. I love Cinnabun Cinnamon Rolls. See I used to go to Maine most summers to see family when I still lived in Iowa. Most flights for us went through O'Hara in Chicago. Not only was I excited to go to Maine but most times I was able to convince my mom(or maybe she didn't need too much convincing) to get a Cinnamon Roll from Cinnabun at the airport. This was sum twenty years ago (Am I really that old?) when they weren't all over the malls like they are today. Cinnabun was so super special to me. With Janie's recipe I could make them at home, where I can have five at once without paying whatever ridiculous cost they charge. It is a dream come true. Dissolve the yeast in the warm milk. Add sugar, margarine, salt, eggs and flour. Mix well until a dough is formed. Knead gently into a large ball on a lightly floured surface. Put dough in a bowl, cover and let rise in a warm place for one hour or until it has doubled. Roll dough out on a lightly floured surface into a 21 by 16 inch rectangle, about 1/4 inch thick. Spread the melted butter onto the dough. Also...this is about the time you want to get that oven preheated to 400 degrees. Combine brown sugar and cinnamon for filling. Sprinkle evenly over the buttered dough. From the long end, roll the dough up tightly. Pinch the seams. Cut into 1 3/4 inch slices. Place in a lightly greased baking pan. Let rise for an hour, uncovered. Bake for 10 minutes or until golden brown. Combine ingredients and beat with a mixer until fluffy. When the rolls are done, spread the icing on top of the rolls. Oh man was this weekend busy. We made the move. We are official in the house. We are officially living in chaos. We got a ton done but we also have tons to unpack still and more renovation work. Somehow I thought that in three weeks we would get everything we wanted too done. Actually three weekends is more like it as I have been away each week traveling. Regardless, I was wrong. We have the living room and master bedroom OK for now. Pretty much everything else is still a mess. Here is too next weekend. Knowing we would be in full force renovations, packing and moving this week I made this month's Pass the Cook Book Club recipe way back at the beginning of September. It was still hot and humid and the oven was a no no. It seemed perfect to pick the Ginger Soy Beef with Chile-Tomatoes for the Pass the Cook Book Club posting. The cookbook of the month was Seoultown Kitchen: Korean Pub Grub to Share with Friends and Family by Debbie Lee. Another option was Spam and Eggs. I couldn't do it. Mr. J was game. But no way for me. 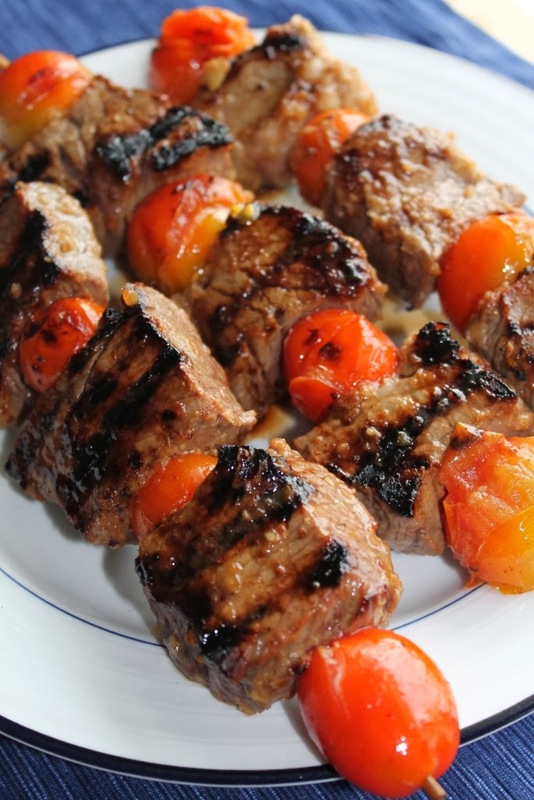 The Ginger Soy Beef with Chile-Tomatoes kabobs were perfect for dinner after a long hot day. Just a little bit of a kick with the marinade but nothing too spicy. I had leftovers the next day on top of a salad. No dressing needed. This month was a perfect example of why this club is so much fun. I would never pick up this cookbook on my own but it was fun making something with Koren flare. We now have another go to recipe when we want to grill. 8 wooden skewers, soaked in cold water for 30 minutes. In a food processor, mince the yellow onion. Add ginger, garlic, soy sauce, brown sugar, mirin and spices and blend well. Transfer to a mixing bowl and add cola, then whisk in the sesame oil to emulsify the marinade. Pour half of the marinade over steak cubes in another mixing bowl. Cover the bowl with plastic wrap and refrigerate for 30 minutes. In a third bowl, place the grape tomatoes, chile-powder, smoked paprika and sesame and olive oils. Toss well until the tomatoes are well coated. Season with salt and black pepper. Once the meat is marinated, assemble each skewer, starting with a grape tomato, then a cube of steak and finishing with another grape tomato. Pre-heat a seasoned grill or grill-pan over medium-high heat. Place skewers on the grill and immediately brush with the marinade. Cook for 2 minutes, then turn over and brush the other side with the marinade. Repeat on both sides for a total cook time of 10 minutes, or until the steak is cooked to your desired doneness. Season with salt and black pepper. Transfer to a serving platter and garnish with scallions. Serve immediately. This week I have been jumping all over the place. Lots of driving. Lots of meetings. I am ready to be home. Living out of a suitcase is rough. I like the minimal selection of clothes - no decision making in the morning. But I hate the packing up every morning. At least I have been getting some good eats. Breakfasts haven't been more that cereal at the hotels but the lunches. Oh the lunches. Lots of soup, salads, and sandwiches. And don't forget the sweet potato fries. Life is quite hectic lately. Between traveling for week, preparing the house, and packing there is little time for anything. Home Depot is my new best friend. But it is the kind of best friend that you know isn't really good for you but somehow you need them. Food right now is convenience only. Eating is quick but needs to be filling. Also, we need snacks and treats on hand for all of those who are helping us move, make repairs, paint, and let the professionals in when we are both not around during the day. Those are the best best friend. 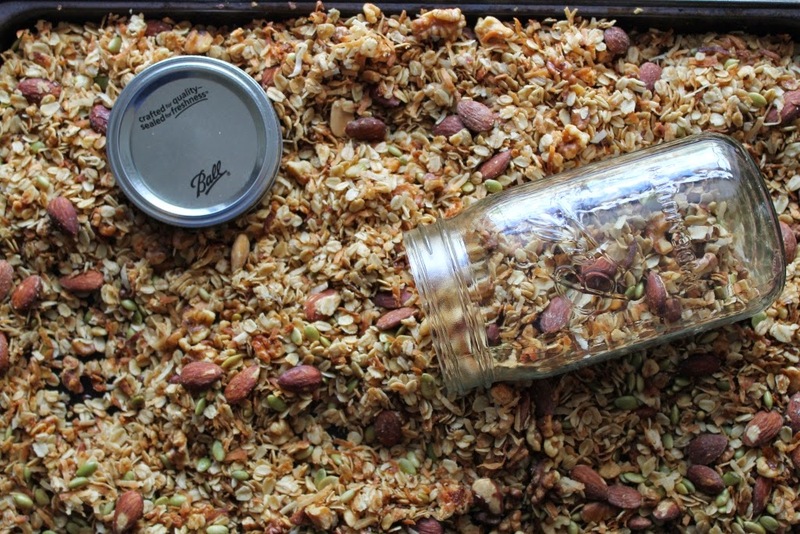 This granola is just that. It is a variation from my favorite granola recipe with cinnamon, makes it more fall. I have been having this for breakfast each more and then bringing it with my on my travels or to the house on the weekend. It is great with milk as cereal, as a topping to yogurt or smoothies, or even just dry by the handful. Toss the oats, cinnamon, coconut, and nuts (save the pumpkin seeds for after baking) together in a large bowl. Whisk together the oil and honey in a small bowl. Pour the liquids over the oat mixture and stir with a wooden spoon until all the oats and nuts are coated. Pour onto a 13 by 18 by 1-inch sheet pan. Bake, stirring occasionally with a spatula (at the 10 minute mark and then every 5-10 minutes), until the mixture turns a nice, even, golden brown, about 45 minutes. I have another peach recipe for you today. I hope that is OK with you? We might even get one more into the mix before peaches whole heartily call it quits for the year. I found this recipe in Real Simple or Cooking Light and instantly knew it was something I needed to make. First, I love all of the ingredients. Second, it can be made in one pot. This recipe is so pretty with the colors from the peaches, basil and red onion and comes together in less than 20 minutes. We had this on the weekend but I wish I had saved it for a more rushed week night. Oh well there is always next time. Heat the oil in a large ovenproof skillet over medium-high heat. Season the pork with ½ teaspoon salt and ¼ teaspoon pepper and cook until browned, 3 to 5 minutes per side. Transfer to a plate. Add the peaches, onion, vinegar, and ¼ teaspoon each salt and pepper to the skillet and cook, tossing, for 1 minute. Return the pork (and any accumulated juices) to the skillet. Transfer to oven and roast until the pork is cooked through and the peaches are tender, 8 to 10 minutes. Whenever I travel breakfasts are a little sad. This one is from Hampton Inn and is actually one of the better eats. A pretty banana and Kashi cereal. To give me some extra boost I add bits of peanut butter to the cereal. There is not thing good about being hungry in a work meeting. I cannot concentrate and my stomach growls loudly. Awkward! I am in South Carolina. A small town. There aren't too many options for dinner. However we always go to one where the upstairs is fancy and the downstairs could be called a dive bar. We opt for the bar. The menu is fantastic. One night was the special of NY strip with arugula, mushrooms, and mac and cheese. The second night was blackened salmon with avocado/tomato salsa on top of cheesy grits. Don't mind if I do. Do you ever get amazing food at a restaurant doesn't quite look like it is capable of such food? Football season is here and I could care less. I have never been a football fan. Don't get me wrong. Friday nights in the fall during high school were spent at football games. I just never watched the actual game. Years later football still does little for me. Mr. J watches in the living room leaving me free time to do what I wish. Most Sundays that means spending time in the kitchen. The other day I got to thinking about mac and cheese and spinach and artichoke dip. Two favorites. Two things that remind me of fall weather and football and Sundays. Put them together and dinner was born. This recipe is a bit lighter with limited butter and chicken broth. Plus two different vegetables baked right in. It was warm and comforting. Easily served in front of the TV. Bring a large pot of salted water to a boil. Add the macaroni and cook according to the directions on the package, 6 to 8 minutes. Drain well. Meanwhile, heat olive oil in a medium saute pan. Add onion and cook until slightly soft. 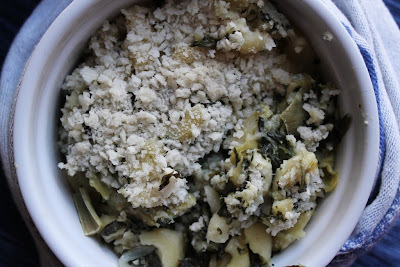 Add garlic and cook for another minute before adding the artichoke hearts and spinach. Turn down to low and stir occasionally. You just want the flavors to blend and the mixture to warm. Melt butter in a large pot and add the flour. Cook over low heat for 2 minutes, stirring with a whisk. While whisking, add the milk and chicken broth. Cook for a minute or two more, until thickened and smooth. Off the heat, add the Cheddar cheese, 1 tablespoon salt, pepper, and nutmeg. Add the cooked macaroni and spinach and artichoke mixture. Stir well. Pour into a 3-quart baking dish. Top with bread crumbs. Bake for 30 to 35 minutes, or until the sauce is bubbly and the macaroni is browned on the top. Remember that pizza from last week? I didn't think I could top it. But I did. Way over the top on this one. And it is super easy. 10 minutes to prep and then 20 minutes in the oven. We made this last night after a day of working on the house. Peaches and prosciutto. It is my new favorite combination. A bit sweet and a bit salty. Perfect for pizza toppings. We ended up eating the whole thing in about 15 minutes. Mr. J was skeptical for about 5 minutes before he jumped on to the idea with both feet. He thought it was the best pizza we have ever made. The. Best. Preheat oven to 400 degrees. Prepare a cookie sheet with a sprinkling of cornmeal to prevent sticking. Roll out pizza dough to desired shape and size. Place on pizza (cookie) pan. Top with tomato sauce. Evenly distribute the peach slices, prosciutto slices, and then the mozzarella slices. Loosely sprinkle the basil on top of the mozzarella cheese. Season with freshly ground black pepper if desired. Cook for about 20-25 minutes on the bottom rack of the oven. The cheese should be melted and slightly browned. It is hard to believe that last week was my birthday. So much has happened since then. A house that needs some work. There was/is wallpaper. We got about 50% off so far. There is lots of odd color paint. This picture doesn't do it justice. There was some major purple going on in the master bedroom. And also some nasty carpet. I am honestly not sure these people knew what a vacuum does. Good thing there is hard wood under there. Since this is such a huge part of our lives right now I will be posting weekly updates on our progress. The weather go back up into the 80s this week so I don't think summer is ready to let go of us just yet. I am not sure if I am ready to let go of it either. A few more weeks of warmer temperatures wouldn't be so bad. Maybe that would be the summer time produce will keep producing. We were lucky to be gifted a CSA pick up when friends of ours went on vacation. It was a lovely haul loaded with tomatoes and eggplant. I love eggplant. Mr. J does not. In a huge effort to think of something he would eat, I realized if I really did up a simple eggplant parmesan recipe he just might go for it. Lucky for me he loved it. We took a bit more time preparing the eggplant, frying up each little round separately before stacking them with fresh mozzarella and tomatoes. We ate this three nights in a row and it never got old. In a shallow bowl, beat to eggs together. In a separate shallow bowl mix panko bread crumbs and Italian season together. One at a time put each eggplant round in the egg mixture. Remove excess and place in bread crumbs. Set aside until all eggplant is breaded. Place oil in a deep saute pan and heat to medium low. Once hot place breaded eggplant rounds in oil and cook for about 1-2 minutes per side. Removed cooked eggplant and place on a separate place on top of paper towels to absorb the oil. Continue until all eggplant are cooked. Grease a 9X13 baking dish. Place 1/4 cup of tomato sauce on bottom of pan. 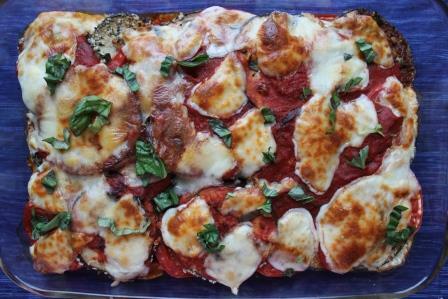 Line bottom of pan with a layer of eggplant, followed by a layer of tomatoes, and then a layer of mozzarella. Repeat until all of the eggplant and tomatoes are used. After the last layer of tomatoes is placed in pan cover with remaining 1/4 cup of tomato a sauce. Top with last portion of mozzarella cheese. Bake in oven for about 30 minutes. Remove when cheese starts to brown and the tomato sauce is bubbling. Sprinkle with chopped basil.